Super Eagles striker, Odion Ighalo, has reacted to the alleged death threat issued to his family in Lagos on social media due to his failure to score goals from clear-cut opportunities against Argentina, saying it was not deliberate. 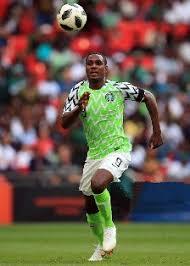 The News Agency of Nigeria reports that Ighalo, who replaced Kelechi Ihanacho in the second half of the match between Nigeria and Argentina in the ongoing World Cup in Russia, failed to convert a pass from Ahmed Musa had incurred the anger of fans. NAN reports that most Nigerian fans strongly believed that if Ighalo had scored the goal, it would have seen the Super Eagles through to the Round of 16 of the World Cup. Speaking through his Social Media timeline, Ighalo, who was involved in Nigeria’s qualification for the World Cup, said that he regretted not scoring the crucial goal. “It is a great experience to play at the World Cup and I enjoyed every moment of it, but sometimes things don’t work the way you want. “But life has to go on, I am grateful to God I did not sustain any injury,’’ he said.